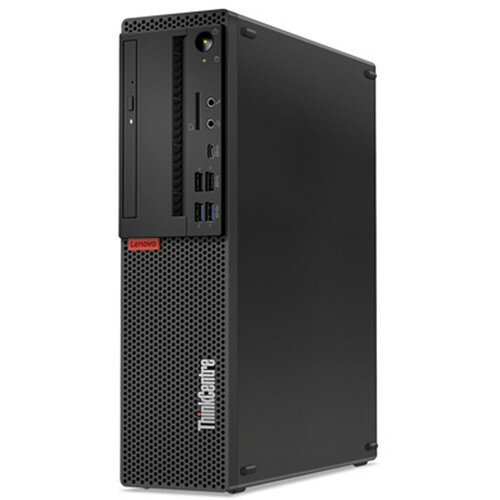 The ThinkCentre M720 SFF Tower Desktop Computer from Lenovo is engineered to work with robust workloads while remaining energy efficient with its 210W power supply and 3.2 GHz Intel Core i7-8700 six-core processor. Coupling this system's multiple cores with its 8GB of DDR4 memory allows you to run various applications simultaneously, so you can get your work done as soon as possible. If you need more RAM for enhanced multitasking, the ThinkCentre M720 SFF's memory can be upgraded to a maximum of 64GB. For long-term storage of your files, a 1TB hard drive offers quick access to your data, and there is an empty 3.5" drive bay for additional internal storage. Box Dimensions (LxWxH) 22.0 x 16.2 x 7.5"
ThinkCentre M720 SFF Tower Desktop Computer is rated 3.8 out of 5 by 32. Rated 5 out of 5 by LouWp from What power! Great machine that is easy to set up and has the power of a bull in a china closet. Rated 5 out of 5 by HHHH1 from GREAT COMPUTER I was expecting a good product from Lenovo and they definitely delievered on this. Top marks. Rated 5 out of 5 by Ever from Amazing performing desktop for everything This desktop is replacing a desktop from another company that has a fruit as a logo. That was an excellent machine. That company cannot replicate this Lenovo Ideacentre 720 for the money. This desktop is a fantastic PC! A very nice feature on this computer is the fact that I can play great games with no issues. I bought an Acer Predator XB272 monitor. This monitor is perfect for this Nvidia card. G-Sync and 1080p go very well with this computer's hardware. I have been playing Assasin's Creed Odessey with zero issues. The game plays very smooth and no lag. The PC also runs pretty cool, although I'm sure it's working hard to play the game. Daily use is excellent. I use Chrome for browsing. I also use it as my home's network, and it broadcasts via Plex to my TV much much better than the computer this replaces. The one drawback to this Lenovo machine is Windows. I did get the Windows blue screen of death recently. I managed to reset the computer and get everything back working well. Lenovo has simple instructions in their support site, and the videos made it very easy. I have read other reviews with customers blaming Lenovo. Well, it's not Lenovo, it is a Microsoft issue. I will strongly recommend any Lenovo product to anyone looking for a computer. Their laptops are excellent, and their Smart Display is a great product. I'm looking forward to many years of using this PC at home. I hope I can learn how to do many other things like picture and video editing to give this computer a workout. I'm sure it'll handle anything I can throw at it. Way to go on a great product Lenovo. (Claps hands) Did I mention this desktop is a beautiful machine? I don't know who picks out the colors and the design; they are beautiful machines! Rated 1 out of 5 by ericw63 from shutting down amazing how things work. i was in the middle of writing a 5 star review about how well this computer was working, how it was easy to set up right out of the box and everything worked fantastic. sadly i didnt get to finish that review because in the middle of it i got a blue screen ( not the blue screen of death ) that said, shutting down. so you dont get a great review when the machine quits while writing the review. i hope this is not a sign of things to come. Rated 5 out of 5 by brueckj from Great Speed I use a program which uses a lot of graphics and large volume indexing and the IdeaCentre 720 is able to load fast under these conditions. Does great with multiple programs running at the same time.